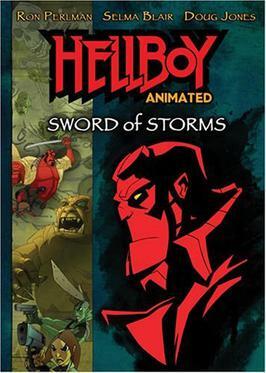 The second Hellboy animated movie. I enjoyed the first movie but this one I liked a lot more. Essentially, it has two story lines: one of them follows the team of Hellboy, Liz Sherman, Abe Sabien, Professor Bruttenholm, and Sydney Leach when they investigate a house for a possible haunting. The house has been recently bought by Oliver Trumbolt, a millionaire who wants to make it tourist attraction. The BPRD team thinks that their presence is just a PR stunt. Except for the Professor who insisted on joining the team. The second storyline starts in 1939, the young Professor and a local Transylvanian team are hunting Erzebet Ondrushko who is not just a vampire but also Goddess Hecate’s high priestess. The professor and the local priest are the only ones of the team who survive. The story moves back in time through out the movie. This team resembled somewhat of the team in Dracula except that it contained a priest. Otherwise, there’s a young bride who is the victim of the vampire and her groom, and the knowledgeable outsider. The constable might be mapped to Lord Godalming. Ondrusko’s loyal minions, two very short old women with sharp teeth, are calling her back to unlife at the manor, of course. The Professor is haunted by his past but is reluctant to reveal more until he’s sure. The story is quite intense and action packed. The BPRD are an experienced team who rely on each other and clearly know each other well. Leach is the new character who is on his first field assignment but he isn’t a screw up, either, and the other characters don’t pick on him as the newbie. The Professor even gets some character development and it was great to see how the other team members tried to protect him. The team fights ghosts and there’s an even epic fight with Hecate herself. At the end, there are pretty clear clues to Hellboy’s real identity and the “Right Hand of Doom” is mentioned. I think they planned to have more Hellboy animated movies. A pity that didn’t happen. In the extras, there’s a short film called Iron Shoes. In another clip the second story has been put together in a chronological order. 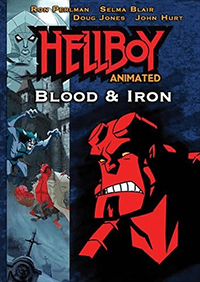 The first animated Hellboy movie. The movie starts almost in a James Bond-like manner: with a short teaser that doesn’t have much to do with the rest of the movie. In it Hellboy, Liz, and Abe are underground in a Mayan temple looking for agent Hamilton, and Hellboy is fighting a giant bat. The bat brings to life various undead around the trio and they are almost defeated until Liz sets the undead on fire. It’s a nice introduction to the characters and their various powers, and I also have an inordinate fondness for this teaser style. The actual movie starts when Professor Sakai opens a long lost scroll and reads the story in it. The story tells about demon brothers Thunder and Lighting who tried to make a bargain with a damiyo but instead end up being trapped into a sword. They possess the Professor who knows that the enchanted katana is nearby. He attacks the man holding the sword as part of his collection but fails to get the sword, and flees. The Bureau of Paranormal Investigations is called in. Hellboy and Professor Kate Corrigan travel to Japan to investigate. Hellboy picks up the enchanted katana and is transported to a mythological land. There he encounters various monsters while he tries to get back home. At the same time, the rest of the team are trying to get Hellboy back and trace Professor Sakai while storms and earthquakes are plaguing the Earth. The core regular cast from the live action movies and the comic return: Hellboy, Liz Sherman, and Abe Sapien. To me, they were in character but I’ve only read two Hellboy comics so far. Liz is the most insecure one; she’s afraid of her powers and that she’ll lose control of them. This is emphasized right at the start, when she’s reluctant to destroy the undead and only Hellboy can calm her down afterwards. However, there’s no trace of the romance between Liz and Hellboy which was seen in the movies. Instead, Abe is forced to give air to a drowning Liz mouth to mouth and this leads to an awkward moment between them. The water breathing Abe seems to be the solid back bone of the team while Helloboy is the muscle. They are all experienced adventurers, instead of wide-eyed novices, and take pretty much everything in stride. I enjoyed the Japanese mythology in the movie. I’m not well versed in it, but I recognized various elements, such as a traveler getting shelter in a strange house and the other guests changing into monsters, and the spider woman demon. And the fox with a woman’s voice who acts as Hellboy’s guide. I think that’s called a kitsune. Despite dealing with demons and the possible end of the world, the mood is more like an adventure story than an apocalypse movie. It’s action packed and fast-paced with a few comic moments, too. The DVD has lots of extras.